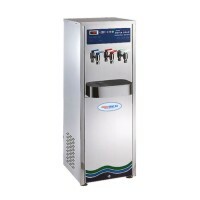 The Economy Fully Stainless Steel Water Coolers is connected to the water mains, guaranteeing constant quality over time and requiring extremely limited maintenance, providing a reliable drinking water system for public areas, factory , waiting rooms, schools and shopping centres. Direct connection to the water mains maximizes hygiene and prevents water from stagnating. Inclusion of both glass and bottle fillers gives one the versatility to either drink directly from the fountain or fill a water bottle. Built-in water filter housings positioned in the base of the unit for easy access and servicing give one the option of easily purifying the incoming water using a wide variety of standard 10” filter and purification cartridges also available from Aqua Kent RO Malaysia. Direct piping water coolers, water cooler boiler, heavy duty water cooler, stainless steel water cooler & boiler, drinking water fountain. WHAT IS IT? 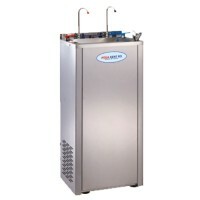 A stainless steel water cooler providing reliable drinking water .. Contact for Price. WHAT IS IT? A high capacity with adjustable hot, cold and warm temperature ..